I'm a WordPress enthusiast who help people solve complex problems around WordPress. Of all the ways to increase website security, setting up a system to back up WordPress is the most crucial. Even in the most secure setups, accidents sometimes happen. Your server could be hacked or malfunction, your site can be corrupted by a plugin incompatibility or taken out some other way. When that happens, the only thing that will keep you calm is the knowledge that you can definitely bring your site back. Downtime isn’t cool, but it’s much cooler than having lost your work completely. There are several ways to back up WordPress and this article will show you all of them. You will learn how to back up your WordPress site manually so you understand the process. We will discuss what to look for in a WordPress backup service. We will go over plugins and services that allow you to back up WordPress automatically so you can decide, which solution is the best for you. We’ve got lots to cover, so let’s dive right into it. When and How Often Should You Back Up WordPress? Before getting into how to back up your WordPress site, we first need to talk about when and how often you should do it because it’s best to have a regular schedule at which copies of your site are created. That way, if you need to restore it, you can use a recent backup and minimize your work loss. However, the schedule will be different for every site. Obviously, a blog that publishes new content three times a week and receives dozens of comments daily needs a backup schedule with very short intervals. The same is true for an e-commerce site that has transactions to track and other important data that should not get lost. On the other hand – a mostly static website that is only updated once a quarter can get away with manual backups or weekly automatic ones. As you can see, there is no cookie cutter answer for your site. You will have to decide what schedule is right. The best way to come up with your own intervals is to decide what would leave you with the least recovery time should the worst come to pass. Apart from that, there are also events before which you should definitely back up WordPress by hand. This is whenever you make large changes to your site that carry at least some risk of something going wrong. One of the most frequent opportunities here is right before an update. When you install a new WordPress version, update plugins or change themes on your site are the prime opportunities for problems (such as incompatibilities) to occur. With a fresh backup, you are much better equipped to deal with them. Besides testing on a local installation of WordPress that is. If you have never created a WordPress backup by yourself, you should do it at least once in order to understand what’s included in it. For that reason, I will quickly cover how to back up WordPress by hand. Even if it’s not the most economical way, the knowledge might save you when you’re in a pickle. 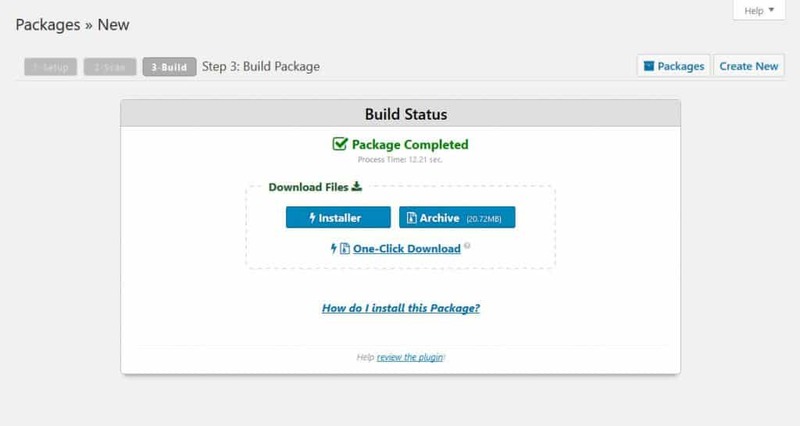 The first step in backing up WordPress is downloading the WordPress files. That’s the data located on your server. 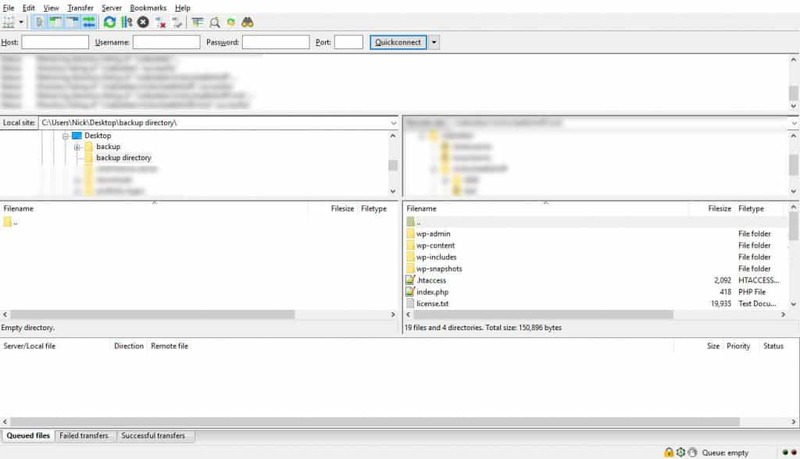 You can access it via FTP with a client such as FileZilla. To get started, create a directory on your hard drive where you will put your WordPress files. Then connect to your server and navigate to your WordPress installation. 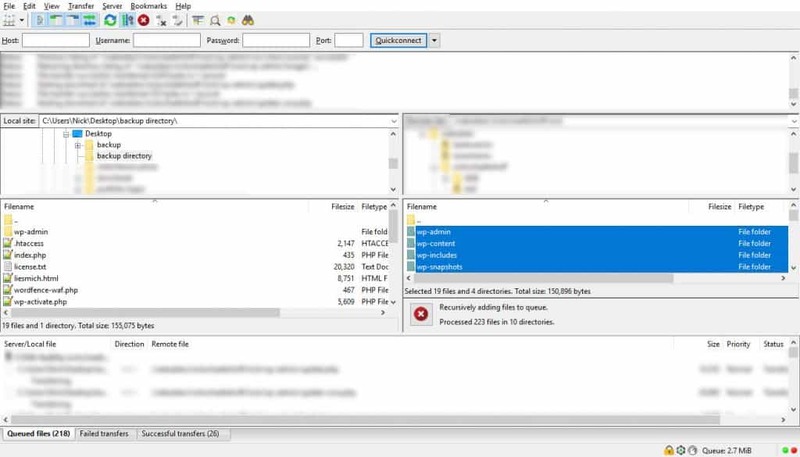 Before you start downloading them, make sure that your FTP client shows hidden files. The WordPress installation contains important files that are hidden by default and you need to make sure to include them in the backup. In FileZilla, you find that option under Server > Force showing hidden files. When that is done, mark all files and folders and drag and drop them to the destination on your hard drive on the left side. If you installed WordPress in a subdirectory, make sure to download both the directory and all files included in your server’s root directory. This will start the download. It will take a while, so we can already move on to the next step. Just a quick note: you can also do the above in a management panel. To achieve that, follow the instructions for cPanel or do a Google search for your system. The second part of your site is the database. It is arguably the more important component, as it contains all of your content – pages, posts, categories – you name it. If you lose the files, it’s at least theoretically possible to bring your site back (assuming that you still have your media files somewhere). However, with the database gone, that’s it. You have to start from scratch. A click will open the database and show you all tables contained within. Here, you have two choices. You can either leave things as they are and hit Go at the bottom. This will prompt a file download of your WordPress database. This is a perfectly suitable solution for small databases as it doesn’t compress them before download. The only caveat is that to restore a database backed up this way, you need to import it into a database without any tables. The second option is to choose Custom, which will give you additional options. This is most suitable if you have a large database as it will allow you to compress it before download. This will considerably speed up the backup. Under Format make sure to choose SQL. 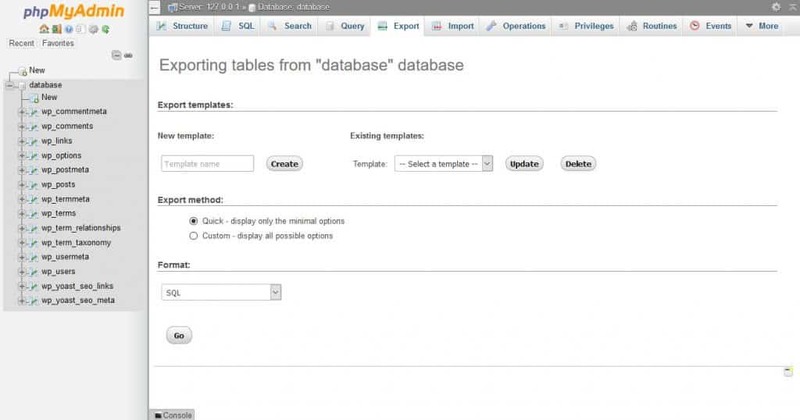 In the Tables section select which database tables to include in your backup. This makes sense if you have several installs in the same database with different prefixes. The Output section lets you choose whether to compress the database file as zip or gzip. As mentioned, doing so will speed up the download of larger databases. You can ignore the first part of the Format-specific options, however, under Object creation options make sure to check Add DROP TABLE / VIEW / PROCEDURE / FUNCTION / EVENT / TRIGGER statement. 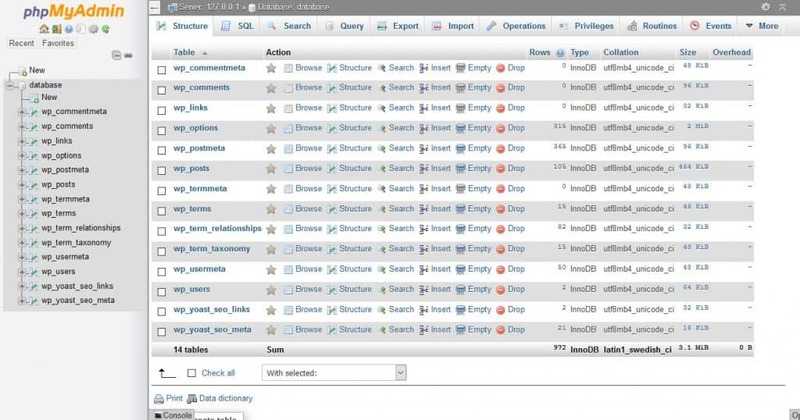 This will delete old existing tables when restoring your database. Leave everything under Data creation options as is and then hit Go at the bottom. This should result in a download prompt for a compressed version of your WordPress database. Save it and you are done. Together with the WordPress files (which should be done downloading by now) you have completed everything it takes to back up WordPress. Put your backup somewhere safe, preferably in several places including a cloud storage service (since computers break too sometimes). Did you think this was a little too complicated to do on a regular basis? Me too. Lucky for us, there are automatic solutions that can do the same without us having to lift a finger. Ability to automate – Being able to automate your WordPress backup is one of the most important factors. Automation takes one more item off your to-do list. You can rest easily knowing that backing up your site is taken care of and you don’t have to remember to do it. Backup frequency – How often does the solution let you back up your site? Is that frequency sufficient for your purpose? Some solutions offer real-time backups and for some websites, it doesn’t make sense to settle for less. Storage location – Where does the solution save backups? Can you use remote storage like Dropbox or Google Drive? Saving backups on the same server as your site defeats the purpose if the server is the reason why your site is going down. Restore ability – How easy it is to restore a site? Does it happen automatically or do you need to do things by hand? There are different approaches to this and some are easier than others. Full or partial backups – Different backup solutions out there offer different backup options. Some only save the database, not the entire site. However, on the list below you only find those that can back up WordPress entirely. Other features – Does the solution offer additional features like site migration? While it’s not crucial for backing up your site, it can make sense depending on your workflow. Of course, the weight of each feature depends on your site and needs. It’s just important to keep these things in mind as you choose your personal solution to back up WordPress from the options below. One of the first addresses to seek in a WordPress backup solution is your hosting provider. Many of them offer regular backups as part of their service. This actually saved my bacon once when a business partner accidentally wiped out our entire website. Luckily, a call to our hosting company brought it all back. Especially managed WordPress hosting providers often offer very good backup services, including automated daily backups (plus the possibility to download them). If your host doesn’t have anything at all in this area, it’s probably a good time to make the switch. You can find lots of material on this topic right here on this website such as tips for the best WordPress hosting. Depending on your site, the solution offered by your provider to back up WordPress might actually be enough. For that reason, it’s a good idea to make it your first port of call. However, if it’s not sufficient or if you’d like something more or you just want an extra insurance, one of the plugins or services below should fit the ticket. Thankfully, the WordPress sphere offers a number of backup solutions. The ones on this list are some of the best on the market. Learn who they are, their pros and cons and the way they handle backing up and restoring websites. Backing up with UpDraftPlus is easy. Just hit the big blue button in the settings and follow the instructions. 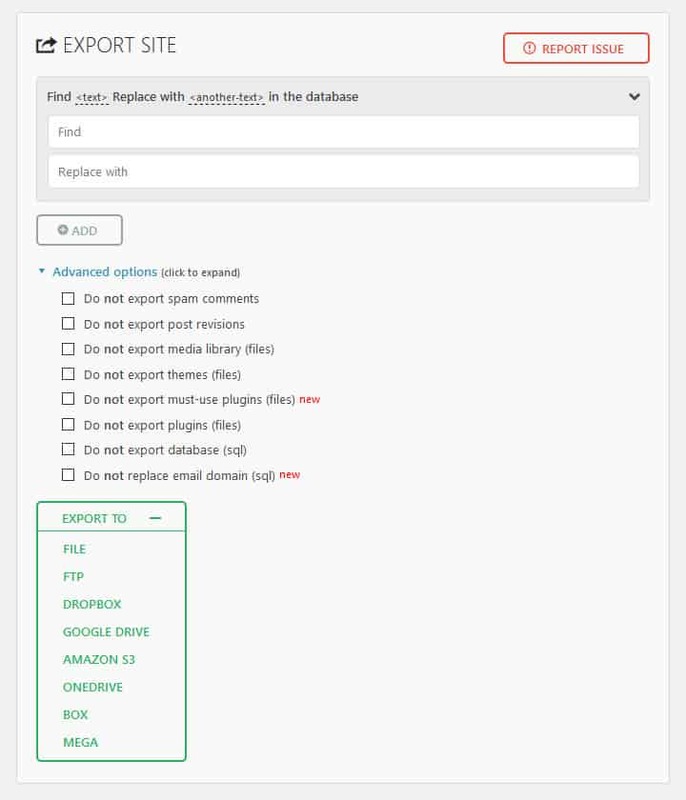 The plugin also allows you to send your site backup to any place you want or keep them on your server. In addition to that, it keeps a list of existing backups that you can download or from which you can restore if necessary. It’s important to note that this plugin divides the backup into several parts (database, plugins, themes, downloads and other) so you can deal with them separately. It also offers scheduled backups by time intervals. However, for more detailed scheduling you need the premium version. That also includes migration tools and comes with a price tag of $70 and upwards (depending on your license) per year. Duplicator is originally a plugin for site migration (and my personal favorite for that purpose) but can also be used to back up WordPress. The problem: since it’s primarily made to migrate WordPress websites, many of the backup features that are available for free in other plugins cost money with Duplicator. Making a copy of your site with Duplicator is easy enough. 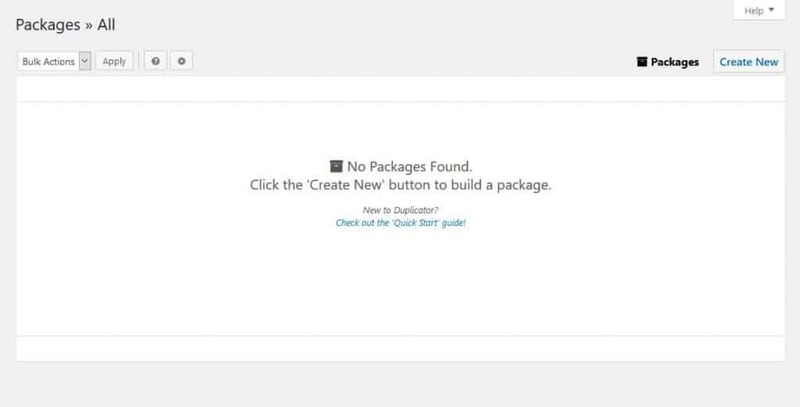 Go to the settings screen and create a so-called package. That’s zipped up version of your entire site (including the database) plus an installer file. You need both of them to restore (or move) your site. Simply upload all files to a server via FTP and run the installer by accessing it through your browser. It will then guide you through the restore process. Be aware that you need an empty database for this to work. Because it can be a little technical, the plugin is not always beginner friendly. However, with some basic WordPress knowledge, it’s very easy to work with. Shame that key features that make it an actual backup solution are missing from the free version. This service is part of the Jetpack plugin and created by the makers of WordPress.com. It offers real-time backups (meaning any change on your site is backed up immediately) as well as one-click restore. It’s also made to be as simple as possible. As mentioned, the plugin is dead simple to use. However, in order to take advantage of it, you need both Jetpack (including a WordPress.com account) and the VaultPress plugin. After that, it’s pretty much set it and you can forget it. Configure it once and VaultPress will from then on keep your site backed up in the cloud from where you can restore them easily. However, you may also download saved copies to your hard drive. The only downside is that there is no free version. Using VaultPress costs $39 per year just to back up WordPress daily. On higher plans, you get the aforementioned real-time backups, automatic file repair and other features. As can be expected from a premium-only solution, it offers a lot more than its free counterparts. Especially the real-time option is good news for really busy sites that change often. Once signed up, the plugin will automatically run backups and notify you whenever one has been completed. If you want to use a different storage location, BackupBuddy offers plenty of options, including Dropbox, Google Drive, Amazon S3 and more. Plus, you are able to set the schedule to weekly, daily and monthly backups. 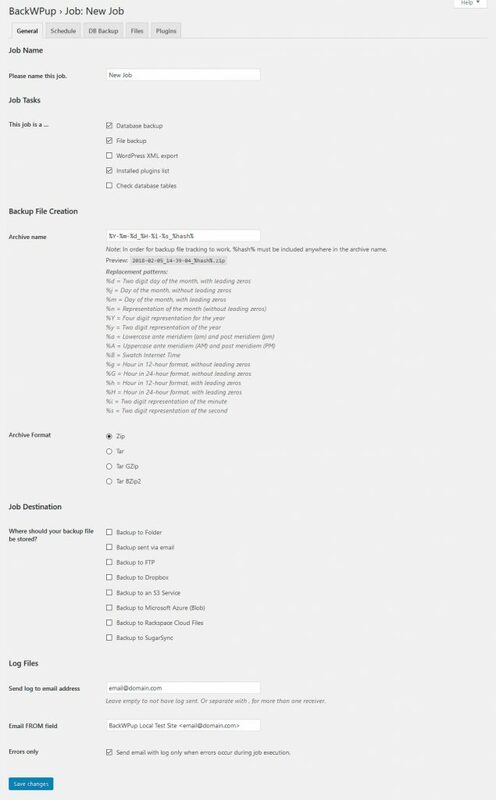 It even comes with the option to set separate schedules for different parts of your site. That means, you can create daily backups for your database and weekly for the entire site. For restoring, you need to download and upload files to your server similar to Duplicator. While there are more convenient solutions on this list, it’s also not the most complicated. BackupBuddy starts at $80 per year. Any license gets you one year of updates, support and access to their Stash service. A nice thing about this plugin is that it gives you more control over the export process. That’s good if you want to exclude parts of your site from being backed up. However, the free version does not offer off-site storage, only downloads to your computer. For the former, you need to purchase premium extensions. On the other hand, All-in-One WP Migration makes restore very simple. Just click the restore button in the list of available backups and it will get going. Alternatively, you can also import a backup you exported earlier. Unfortunately, there is no automatic backup scheduling (which is a bit bewildering), so if you have a site that changes a lot, it’s probably not the right plugin for you. 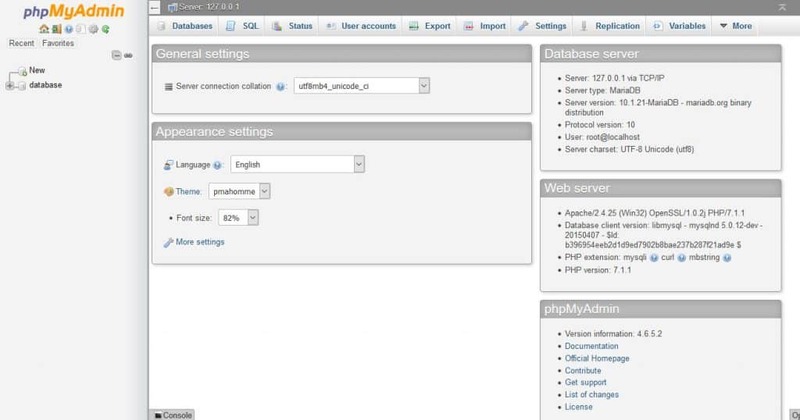 BackWPup has a lot of configuration options such as the ability to use the WordPress command line interface. This is pretty cool for advanced users but might confuse beginners. The way you back up your site is to create a job. That’s just the name for whatever task you want the plugin to perform. In addition to that, you are also able to set a schedule for when the plugin should repeat jobs. The free version even works with WordPress Multisite. However, it has a big downside: it currently offers no tool for restoring your site automatically. Instead, you must upload your files via FTP and import the database manually. Therefore, in combination with the advanced options, this may not be the best solution for beginner users. The plugin is easy to use. Just install, activate and it will automatically back up your database daily and entire site on a weekly basis. Aside from that, you also have the possibility to manually back up WordPress with one click. You are also able to change the backup schedule to your needs or liking. The only downside is that for off-site storage you need the Pro version, which clocks in at $29 per year and upwards. 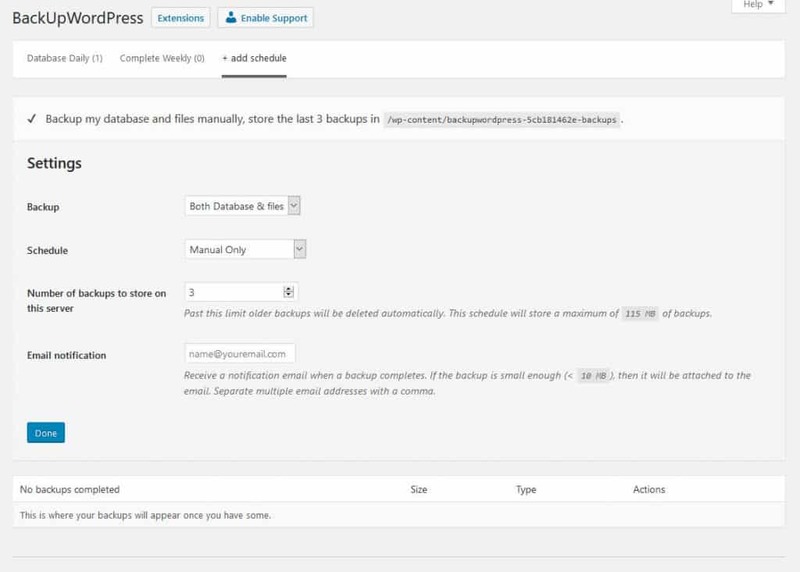 In the free version the backups reside on the same server as your site, so you need to download them to keep them save. Plus, this plugin doesn’t have a dedicated restore function and is thus not super suitable for beginners. Are You Ready to Back up Your WordPress Site? Your website is an asset that’s worth protecting and having a backup solution in place is one of the baseline measurement to do so. In this post, you have learned everything there is to learn about backing up your WordPress website. We have talked about how to figure out the right schedule and gone over the process of doing a WordPress backup manually. After that, we have looked at requirements for automatic backup solutions and some of the best plugins and services that can do it for you. A positive takeaway from this is that there are many free solutions out there that offer a lot without costing anything. Plus, even the premium solutions are pretty affordable and come with powerful features like backups in real time. Now it’s up to you to decide what is most suitable for your site and needs. Whichever you go with, the important thing is that you put a system in place, because you can’t put a price on the peace of mind of knowing your hard work is safe. What’s you favorite method to back up WordPress? Anything to add to the above? Let us know in the comments section below! Hey Bill, I’m glad you like the post. Yes, you can also use the export/import function to move your content. You just need an existing website to import into. When you do, be sure to check the option that also migrates your media files. When you do that, you usually shouldn’t have to manually use the uploads folder. The reason I didn’t mention this option is that most of the time, people want to save their entire site including plugins, themes etc. as well as their configuration. This is not what the built-in WordPress functionality is for. It can only move/back up your content, nothing else. Nick Schäferhoff, thanks a lot for the article post. Much thanks again. Fantastic. I’m happy you liked it! Thanks for taking the time to comment. Cheers!